One of the most interesting and unique sounds of the mid-fifties came from a band I love, the Shangri-Las. Composed of two sets of sisters — lead singer Mary Weiss and her older sister Betty, and the identical twins Marge and Mary Ann Ganser– all of the band members were teenagers when they first signed with Red Bird Records in April 1964. The real standout of the Shangri-Las is Mary Weiss, the little blonde girl who could sing like a black woman. Fifteen years old when the band was started, Mary — with her long, straight hair and utterly innocent face– could belt out opening lines with the fierce, chesty gravitas of a budding Aretha. It’s not this capability that interests me so much as Mary’s cultivation of it. The “black” sound was beginning to appeal to mainstream white audiences. And obviously, there was something in it that Mary, too, liked– some power she wanted to mimic or possess, at least for short bursts of time. Due to a lawsuit about which Mary Weiss is always vague (“everybody around us was suing one another,” she told the New York Times), she was banned from recording for the decade following 1969. She worked for an architectural firm and a furniture dealership. One of the Ganser twins died suddenly at age 33, and the other has also passed away. The Shangri-Las were short-lived, but their influence lives on. A Shangri-Las hit that has taken on a life of its own in the intervening decades is “Remember: Walking in the Sand,” an odd, slightly dark piece about love and loss. It’s said to have been written by George “Shadow” Morton on the fly to impress Jeff Barry, who’d asked to hear what Morton could write. As the story goes, Morton parked his car beside the beach and scribbled out the song in a few minutes. A 15-year-old, unknown Billy Joel played piano on the demo, which was nearly seven minutes long, and the Shangri-Las did the singing. Jeff Barry was sufficiently impressed and got Morton and the Shangri-Las signed with Red Bird Records the following week. Seagulls aside, the song is strange and unique, and Mary’s voice is haunting. Her “no, no, no” has the heartbreaking, unself-conscious feel of real sorrow. Aerosmith asked Weiss to provide backup vocals, and you can hear her odd, lovely voice in the background: it was a classy move of them, and only makes the song better. …but her swagger, while impressive, blunts some of the emotional power for me. But I’ll always like Mary Weiss’s version best. In 2007 Weiss released the album “Dangerous Game,” my favorite song of which is the sweet, almost awkwardly heartfelt “You Can Stay With Me.” Her voice has not improved over the years. Still, there’s an earnestness that’s exactly reminiscent of the tone of the early fifties girl groups: honest, yearning, maybe a little bashful. She put in seagull sounds at the end. It was little inside joke to her longtime audience, her fans. The first time I heard it, I laughed out loud. In that moment any of the song’s awkwardness was gone, and I thought: Well, dang. That’s one of the coolest things she could have done. 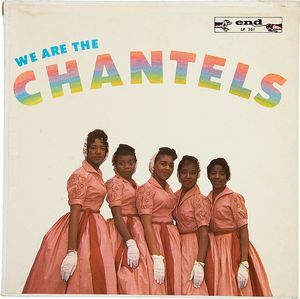 The Chantels were a “girl group” made up of Arlene Smith, Jackie Landry Jackson, Sonia Goring, Rene Minus, and Lois Harris. The girls attended high school together in the Bronx. 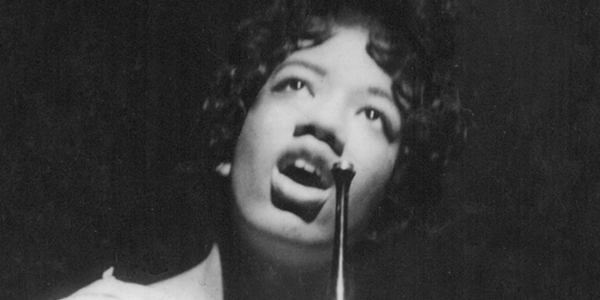 Arlene Smith, the group’s lead, had been classically trained—she performed at Carnegie Hall when she was twelve. 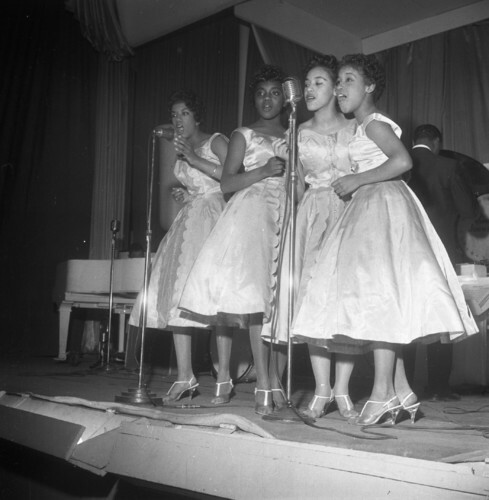 Her songwriting and her voice would lead the Chantels to become only the second mega-hit African-American group of the fifties, after the aforementioned Bobbettes (with their obsessive, ill-fated relationship with Mr. Lee). Arlene Smith has an unusual voice: clear, strong, almost off-key in a strikingly honest and emotive way. She reminds me a little of today’s Adele, but much younger and much less showy. There are no choral acrobatics, but she can channel a pure hurt and longing the way Adele can. I listened to “Maybe” on repeat when writing Nat’s sections of the novel. That song, to me, is Nat. She would have listened to it – maybe while cooking dinner, with the girls underfoot; maybe alone at night when she was bored and feeling blue. It might make her think of Paul or it might make her think of Esrom, depending on the day; that’s Nat for you, and I don’t think it makes her a bad person or a duplicitous one, but simply one who takes her own feelings for what they are and tries to manage them without having quite the heart to restrict them. I think Nat would’ve loved the Chantels. I think she would’ve bought their initial album cover, which boldly showed a photograph of the all-black group. 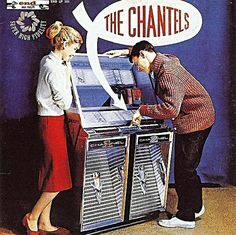 The 1950s weren’t quite ready for the Chantels, however; that cover was pulled and quickly replaced by another, of two white teenagers in a record store, picking out a song from a juke box. Sales soared. But the Chantels were paving the way, sharing a sound and an emotional tenor that white listeners would embrace over the following years. Today: one of my favorite groups of the 1950s, the Del Vikings! They’re a favorite of mine for several reasons. First, I love the simplicity of their music, voice-driven and emotional, with a great range from the lowest baritone to the highest alto — exemplifying that 1950s sound. Secondly, as part of a military family, I can’t help but love the fact that the Del Vikings were formed on an Air Force base, entirely by a group of airmen. Imagine, a band interrupted by the fact that two of their members were suddenly stationed in Germany! It sounds quaint, but their service came first, and they were initially forced to work their musical careers around their prior commitments. The Del Vikings were one of the first integrated mega-hit bands. I find this notable partly because I see it as coming out of their military service — I don’t think the military gets enough credit for being the integrative and diverse force that it is. In 1955, most of your hit bands were either all-African-American or all-white. Not the Del Vikings, who originally had four black members and one white (the band’s composition would change over time, in various iterations). When I come home, will you be waiting? When I come home, must my poor heart be aching? Will you be there when I come home? How could I not think of poor Paul, exiled in Greenland, wondering how Nat would greet him when he came home? Lastly, you simply cannot argue with hits like “Come and Go With Me,” “Little Darling,” and “Whispering Bells” — so please sit back and enjoy the ride, just as folks did in 1955.